We pledge not to profit from excessive shipping charges like some online retailers. That's why we've got a flat-rate shipping price of only $11 on all orders shipped within Australia. And because you know the cost up-front, there's no time wasted trying to discover convoluted and non-transparent shipping costs. We carry a large range of the latest computers, computer parts, peripherals, network hardware and communication technologies to keep your home or business up to date. As professional IT engineers and technicians, we usually have real world experience deploying and administering the products we sell. We're already looking after technology procurement for heaps of Aussie businesses. It's cheap. It's quick. Most importantly, it leaves your skilled staff for more productive tasks than filling in web forms and chasing absentee suppliers. Set up an account with us today, to order by any method that suits your business. Premium Triple Monitor Mount with Desk Clamp Heavy Duty VESA 3 Screens up to 24"
Shipping is a low flat rate of $11 on all orders.Don't waste time trying to calculate shipping costs. Don't suffer from 'Freight Shock' during checkout. 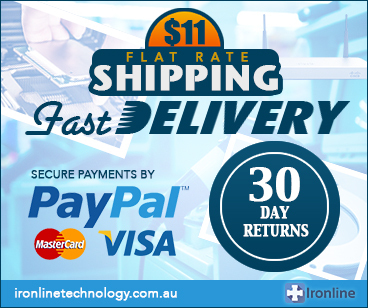 We endeavour to dispatch your order within 12 hours.Most orders are delivered in 1 to 3 business days. We use Australia Post and Mainstream Couriers. 30 Day Returns policy for un-opened or DOA items.Australian Statutory Manufacturer Warranty applies. Technical help available to support your new products.